This site has been developed by David Kilner and Roger Kilner, descendants of Edward Kilner (born 1819). We are interested in building up our knowledge of the family of Edward Kilner. Thanks to the extensive work carried out by another researcher, we know Edward’s ancestors back to about 1600. This information can be accessed by clicking here. In the following information, members of our direct line to Edward are indicated by means of underlining. Edward Kilner was born in East Grinstead on the border of West Sussex and Surrey in 1819. He was christened on 23 May 1819. Like most of his ancestors he became a farm labourer. His parents’ names were Edward Kilner and Elizabeth Elliott – married 8 December 1816 at the historic Worth Church - Click here for more information. Eleanor born about 1851 East Grinstead. From the above it appears that Edward and Ann had three children before they formally married. Ann Brooker was the daughter of Thomas Brooker, a labourer. At the time of the 1851 Census Edward and Ann were living at 2 Barrack Houses Ashurst Wood. Edward Kilner the younger was born 11 June 1848 at East Grinstead. His occupation is given as Labourer on his marriage certificate and Farm Labourer on his son’s birth certificate. Edward married Philadelphia Marden in the established church at Forest Row (adjacent to East Grinstead) on 9th May 1874. Philadelphia Marden was born in 1854 and christened in Lingfield Surrey on 26 March 1854. Her parents were John Marden (a labourer) and Harriett. Her grandparents were William Marden and Lucy Gibbs, married 8th April 1822 at East Grinstead. Philadelphia was calling herself Phillis by the time of the 1901 Census. They then lived at Bowers Place Worth. (The assumption is that Phillis and Philadelphia were the same person).Phillis died 20th September 1907 (aged 53) in the East Sussex County Asylum, Hellingly, sufering from "dementia and general paralysis". Edward died at 98 Railway Approach East Grinstead on 4th October 1922 aged 74 years. He died of a cardiac arrest. George Kilner Senior was born 7th September 1875 at Ashurstwood near East Grinstead. By 1901 he had moved from East Grinstead to Slade Green in Kent. Family legend says he moved to work on the brickfields near the River Thames. At the time of the 1901 Census he was living at 1 Castle Tce Hazel Rd Slade Green and was working as a bricklayer’s labourer. George married Alice Harriet May at the Parish Church at Crayford in Kent (St Paulinus) on 17th August 1908. Alice was born 20th July 1877 at 7 Norfolk Cottages Hazel Rd Slade Green, the daughter of John Isaac May (born 1845) and Jane May (nee Hopkins) (born about 1848). She was still living with her parents in Hazel Rd at the time of the 1901 Census. The Mays and the Hopkins and George Kilner all lived in Hazel Rd in 1901. The Mays and the Hopkins lived there in 1881. George and Alice lived initially at 47 Hazel Rd Slade Green after their marriage but not too long after that they moved to Lambeth. George was described as a labourer on his marriage certificate but in other records he appears as a brickmaker and then a fencing contractor. George and his family later moved to 54 Northumberland Park Erith. George died there on 2nd June 1935 of tuberculosis. He is buried in Erith Cemetery, Brook St, Northumberland Heath. Alice died on 15th February 1949 and is also buried in Brook St.
George Stanley Kilner was born on 6th June 1910 at 29 Riverhall St South Lambeth. Riverhall St no longer appears to exist. 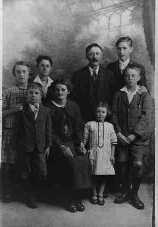 Sometime between 1910 and 1921 the family moved back to Kent, continuing the long association with the Slade Green/Erith area. During the 1920’s and 1930’s the new suburb of Barnehurst was developed south of Erith and west of Slade Green. George attended Central Boys School in Erith, from 1921 to 1924. He obtained very good results and subsequently trained as a commercial cost clerk. He worked at William Cory Coal Merchant at their Charlton Barge Works in London from 1924 – 1957. He married Maud Elizabeth Jackson at Dartford on 6th July 1939. At time of his marriage George was living at 32 Midfield Ave Barnehurst (presumably with his brother Arthur and sister May). After the marriage they moved further up Midfield Ave – eventually to number 27. In 1957 the family migrated to South Australia where he worked at a small goods firm William Angliss from 1957 - 1965. He was an amateur botanist in his youth. He loved gardening. He smoked heavily and died of a heart attack aged 55 on 15th November 1965. He was buried in the Salisbury public cemetery in South Australia. George and Maud had three children (including us). Where any of the above are buried. Join the prefix and suffix with the "at" symbol to get David's e-mail address.